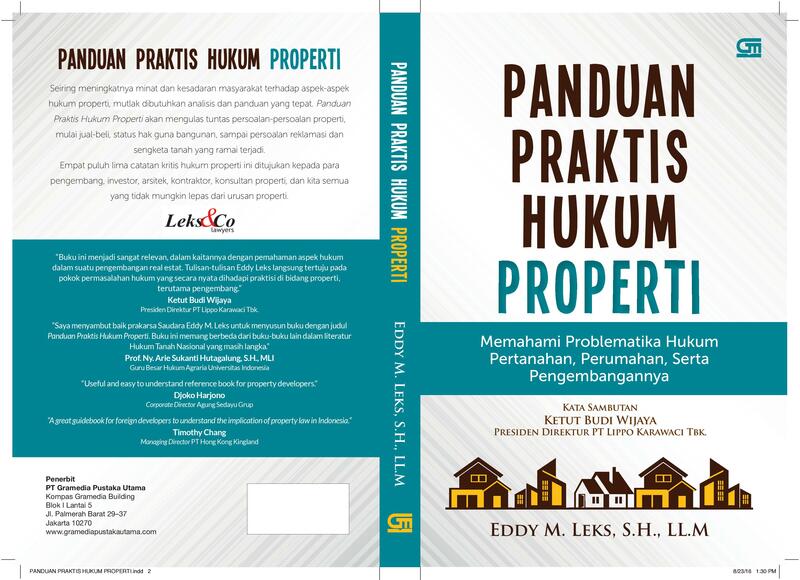 My first book will soon be published by Gramedia with a title of "A Practical Guide to Property Law" (Panduan Praktis Hukum Properti). This book is essentially a compilation of my previous various articles, opinion, and thoughts on housing, condominium, land, and property development law in Indonesia. Some articles were written in English language. It is expected to finish in September 2016. I thank everyone who has assisted me during the process, since this was approximately a 6-year span of writing period, especially Pak Indra Utama of Property&Bank magazine and Pak Cipta Wahyana of Kontan. Thanks to Pak Ketut Budi Wijaya, President Director of PT Lippo Karawaci Tbk and Prof Arie Hutagalung, Professor of Agrarian Law of Universitas Indonesia who gave a welcome note for my first book. Further, I thank some of our firm's clients and colleagues who gave testimonies for this book. I am really grateful and appreciate it! Will keep you updated on the progress of printing and I do hope that the book will be useful for practitioners on property, developer, in-house lawyer, government officials, lawyers, and law student.